When Mac set out for the Academy, it seemed like he was walking through a ghost town. No one was around to see him off, and it hurt him a little that he wouldn’t have a last view of all the people that he cared about. He understood that they were all dealing with the loss of him leaving in their own way, but what about his own loss? He wouldn’t have them to help him through the tough times. He would be completely alone, unless he managed to make some friends. Straightening his shoulders, Mac proudly walked away from his childhood home. The Stone Giants must have been out of the house, because there was utter silence around him. The pads of his feet kept him silent enough to listen to everything around him. The ticking of the cuckoo clock thundered in his ears as he made his way out of the dining room. It could have saved him hours if he would have gone directly across the room, but any good warrior could tell you that the most direct way wasn’t always the safest. Mac made his way around from one piece of furniture to the next, listening for anything that might be out to get him. In this house, spiders were starting to be seen, and more patrols were going out to find them and destroy them before they had a chance to lay eggs. Being caught alone, without Academy training, was not very appealing to Mac. He had made sure that nothing in his pack would rustle or give away his position before he left, and now he was getting the feeling that something was watching him. He had no idea how his position had been given away, because he hadn’t made any noise at all. Sighing, he knew it wouldn’t do him any good to wonder. He pulled out his trident, his paws slipping a little on the shaft because they were slick with nervous sweat. Mac continued on. The feeling of being watched didn’t go away. However, any time that he whipped around to see the blind spots around him, he couldn’t see or hear anything but his own nervous breathing. Mac was beginning to think that he was being completely ridiculous when he heard something behind him. It sounded like something had banged into the leg of the couch that he had cleared about ten minutes ago. A chill ran down his spine. This was it. He hadn’t been invited into the Academy two years early for no reason. He gripped his trident firmly, then circled around so he would be coming up on the leg of the couch from a completely different angle. The closer he got, the more he felt like something was behind that leg. Small scuffles reached his ears, and a low voice muttered something intermittently. If it had a voice, then that at least meant that it wasn’t a spider or a snake. They didn’t have the capacity to talk. Mac flattened himself against the leg of the couch, took a deep breath, and started to peek around the corner. What he saw stopped him dead in his tracks. It was a dust bunny. A female dust bunny. “Are you following me?” The words burst out of him before he had a chance to think of how he should handle this situation. The bunny spun around, a scimitar in her paw, and a shield on her other arm. “Get back! Don’t think I don’t know how to use these!” Her voice shook a little, but there was nothing but steadiness in the way she held her weapons. Thinking that it would be better to just talk, Mac lowered his trident to the ground, putting his hands up in a show of peace. The girl didn’t drop her weapons, and that was alright with Mac. Provided that she didn’t charge him. “Are you following me?” he asked again, a softer edge to his voice now. “No. I’m on my way to the Academy.” Mac looked at this dust bunny and wanted to laugh. She was small, even for a female, but she was dressed in armor that depicted the moon and stars, with a sun yellow bandana holding back her long hair from her face. These things marked her as part of the Schlaf Clan. He had to say that he was pretty impressed that she wielded the scimitar with such ease. It was a hard weapon to learn, and he was seriously hoping that he wouldn’t have to learn to use it at the Academy. Speaking of the Academy, this bunny had said that she was on her way there. That couldn’t be right. There were no female bunnies allowed to train in the Academy. He must have misheard. She was probably on her way to the female Academy. “You mean the domestic Academy, right?” he asked, just for confirmation. She glared at him. If looks could kill, Mac never would have left that spot. “No, I mean the Warrior Academy. The same one you’re going to, by the looks of it.” Her chin jutted out in defiance, and he realized that she wasn’t one to be trifled with. “But you’re a girl! They wouldn’t let you in! Females can’t get into the Academy, it’s a fact!” She drew herself up to her full height, which looked to be about shoulder high to Mac, and glowered at him. “Yes, I’m a girl, and yes they let me in. I’m the first, but I promise you that I won’t be the last. Facts change!” The vehemence in her voice almost made him take a step back. Part of him wanted to ask her if they could travel together, since they had the same destination at the end of their journey, because she seemed like someone who could help him deal with any troubles that might arise on the road, but another part of him had too much pride to ask a girl to protect him. “I’m going to pick up my trident now, but I’m not going to attack you. I’m just going to go back to my journey.” Her eyes flashed at him, and the tip of her scimitar followed his every move. Mac had never moved so slowly in his life. He thought about saying something else to her, but he couldn’t think of anything. Picking up his weapon, he turned away from her, feeling her glare digging into the middle of his back as he walked. He made his way back the way he’d come, hoping that he wouldn’t get a scimitar jammed between his shoulder blades. The shadows were beginning to stretch, and soon it would be dark. Mac’s legs were burning from walking so much, and his stomach rumbled. He should probably stop to eat and rest for a little while, but part of him wanted to be brave and tough it out. Soon, it got too dark for him to see, and he took off his pack to rummage around for a candle and some flint. He checked his pack again, once he’d taken out what he needed, making sure that it wouldn’t make any noise when he moved. He lit the candle, then put the flint into his pocket rather than taking the time to resituate his pack. He kept the candle as shielded as he could. Not for fear of any wind blowing it out, but for fear of being seen by something unfriendly. He was moving through the kitchen now, and he was on high alert. This was where the ants and spiders were the most fierce, because the Stone Giants left morsels of food everywhere, attracting the animals. His heart was pounding loudly in his ears, and he was afraid that he wouldn’t be able to hear any threats until it was too late. The long hours of walking alone didn’t daunt him. It was something that would toughen him up for future patrols after he graduated. His biggest fear was that he would meet something he wasn’t ready to handle yet, since he hadn’t had any training. A loud grunt drew his attention. It came from somewhere up ahead, and to the left. Sweat slicked his trident, and he tightened his grip on it. A scuffle was going on ahead of him, and it sounded like a battle was in progress. Mac followed the noises as best he could, drawing ever nearer to it, even though it was slightly out of the way of the path he needed to be travelling. The noise was coming from the space between the Stone Giants’ refrigerator and the wall. When he peeked around the corner, he saw a dust bunny in full armor, fighting a spider. The spider was small, but he recognized the red hourglass on its fat body that marked it as a Black Widow. Mac sucked in his breath. He dropped his pack and leapt in to aid the bunny. The spider was dripping blood from a half dozen shallow cuts that the bunny had given it with its broadsword, but the sword was too short to give the spider any real wounds. Mac’s trident was longer, and he lunged in to bury the tip in the soft underbelly of the spider. At the last second, the spider moved, sensing the new attack, and the trident hit the harder exoskeleton instead. It marred the red hour glass, but it wasn’t enough to actually hurt the beast. The dust bunny didn’t even stop to stare at Mac, he just threw himself down on his back, trying to shove the tip of the sword up into the spider from underneath. While Mac distracted the head, the other bunny did his best to get his sword in the softer part of the spider’s belly. Spiders weren’t that smart, and this one was no different. The two bunnies caught its attention, and it stopped to look back and forth between them, as if weighing which one might be the bigger threat. In its moment of hesitation, Mac thrust the tip of his trident into the spider’s many eyes, puncturing three, and watching as the green goo inside began to flow out. The spider screamed in pain, and the other bunny took that opportunity to thrust his sword up and twist it deep into the spider’s gut. The spider started to convulse before it tried to stagger away. The weight of the bulbous body yanked the sword out of the bunny’s hand, but Mac followed the spider with his trident. It didn’t get more than a few steps away before it sank down, pushing the sword deeper into its weak spot. The final, agonized scream reverberated around the two bunnies, as they watched, the spider fell onto its side and lay still. They froze, watching, to make sure that it didn’t catch a second wind. Moments went by, and the beast didn’t stir. 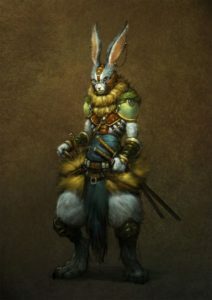 The other bunny made his way up to the carcass, grabbed the hilt of his sword and tugged it out. “Yuck. This wasn’t what I wanted to happen on my trip.” Mac felt a smile stretch his face. “That may be true, but you made it through this alive.” The bunny whirled around in one smooth motion and bowed to Mac. “I appreciate your help. My name is Bluster, and I’m from the Buero Clan.” His broadsword resembled one of the giant letter openers that the Stone Giants had for opening their mail, and the armor on his chest showed a quill and inkwell. “I’m Mac. I’m from the Ess Clan. It was a pleasure to be of service.” The two bunnies shook paws.